Immunity, oil prices, epic short squeeze, asset sale chatter, and another potential debt swap sends the stock surging. Still, a nearly 50% jump is nothing to sneeze at. Here are the five things that fueled its stunning rise. 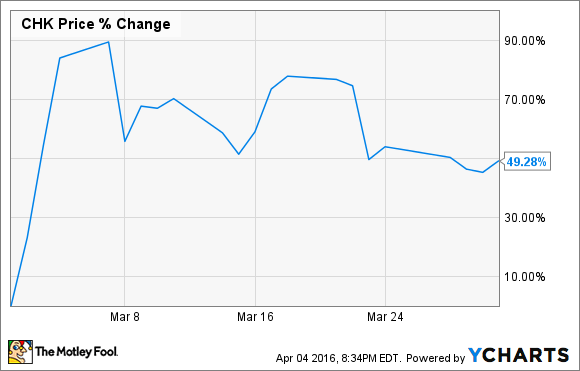 So what: Chesapeake Energy actually got the month off to a rough start. Shares initially slumped on a report that its founder and former CEO Aubrey McClendon had been indicted by the U.S. Justice Department for conspiring to rig bids for oil and gas leases. Chesapeake Energy, however, subsequently announced that it "does not expect to face criminal prosecution or fines" relating to that matter. That news ignited the stock's stunning rise higher, with it jumping upwards of 70% on that news. McClendon's charges, however, were subsequently dropped after he was killed in a car crash. In addition to that immunity news, Chesapeake Energy's stock was caught in an epic short squeeze in the energy sector that was fueled in large part to the rise in the oil price, which enjoyed its best month in a year rallying 14%. That oil fueled short squeeze sent its stock up 89% in a week after shorts bailed on the stock. Chesapeake Energy was joined by a number of heavily shorted energy stocks, including companies like Atwood Oceanics (NYSE:ATW) and Seadrill (NYSE:SDRL) that also exploded higher, up 57% and 164%, respectively, in the first five trading days of March. Shorts had taken huge positions in these stocks, selling short 40.5% of Chesapeake Energy's stock, 42% of Atwood Oceanics' stock and 17% of Seadrill's stock. With such a huge percentage of the outstanding float sold short these traders were forced to compete against each other to buy the stock to close their short bets amid the sharp rise in oil last month after OPEC and other producers reportedly agreed to a production freeze. If that wasn't enough, Chesapeake Energy also benefited from reports that it was looking to sell more assets and pursue another debt exchange to repair its beleaguered balance sheet. According to one report Chesapeake Energy was considering the sale of its STACK assets in Oklahoma, which could fetch between $300 million to $700 million. Such a sale would put it well on its way to hit its target to sell upwards of $1 billion in assets this year to reduce its debt. Meanwhile, another report said that the company was considering a 1.5 lien debt exchange in order to push back near-term debt maturities by offering investors debt that was higher up in the capital structure. If successful, these moves could significantly reduce net debt, while also eliminating its near-term debt maturities. Now what: Chesapeake Energy's stock enjoyed a really breathtaking rise in March. However, the rally was mainly fueled by short-sellers running for the exits rather than actual progress the company made on addressing its large debt load. What investors really need to see is tangible progress, such as exceeding its asset sale target and a very successful debt exchange to push back all of its near-term maturities. Until that happens, or oil really rebounds sharply, this company will remain dangerously close to the brink of bankruptcy.